When John T. O’Connor retired in 1997 after 50 years as a priest, parishioners at the Church of the Holy Spirit in Newington named their parish hall after him. On Tuesday, after the Hartford Archdiocese included O’Connor in a list it made public of Catholic clergymen who have been credibly accused of sexually abusing minors, the current parish priest said O’Connor’s name would be stripped from the hall. “Certainly we’re going to remove his name and anything else with his name attached,” the Rev. Shawn Daly of Annunciation Parish said. O’Connor died in 2003, but the abuse scandal that has battered the Roman Catholic Church continues to preoccupy leaders of the faith and drain organizational finances. Besides naming 48 priests accused of abuse, the archdiocese also announced it has paid about $50.6 million to settle more than 140 claims of sexual abuse. Among the priests identified Tuesday is a member of the Hall of Fame for the Connecticut State Firefighters Association, several priests who worked as chaplains at area hospitals and two who have been arrested on criminal charges. The archdiocese also announced it would hire a retired state judge to review priest personnel files in an effort, according to Archbishop Leonard Blair, to remove the “dark cloud” that still hangs over the Catholic Church. 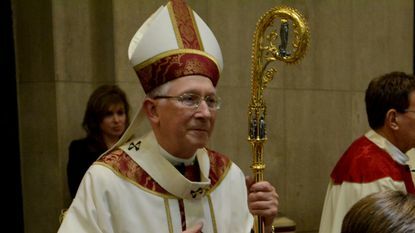 “I have been a bishop now for almost 20 years and most of them have been overshadowed by the sin and scandal of sexual abuse and its devastating effect on the victims, survivors and their families, on the morale of our priests and on the faith and even the practice of the faith among the Catholic people,” Blair said in a statement released on the church website. “The lingering unhealed wounds from past abuse continue to cry out for further actions and answers." David Gianfredi, now 57, who was allegedly abused by the Rev. Thomas Glynn at St. Clare Church in East Haven, said Tuesday’s release of names is a good first step, but those who allowed the abuse to continue by shuttling abusers to other parishes must be held accountable. Gianfredi, who now lives in Utah, helped Glynn at the rectory after Mass when he was 12. His job was to answer the phone or the door. Glynn used the opportunity to assault Gianfredi, the lawsuit filed by Gianfredi alleges. “If they wouldn’t have covered things up over the years and handled it like they’re handling it now, and there was transparency, there would be a lot fewer cases, a lot fewer people getting hurt, me being one of them,” Gianfredi said. The priests identified Tuesday include: Gregory Altermatt, Joseph Buckley, Stephen Bzdyra, Herbert Clarkin, Stephen Crowley, Robert Doyle, Ivan Ferguson, Stephen Foley, Glynn, Paul Gotta, John Graham, Philip Hussey, Edward Hyland, Joseph Lacy, Robert Ladamus, Felix Maguire, Terry Manspeaker, Richard McGann, Daniel McSheffery, Peter Mitchell, Edward Muha, Howard Nash, O’Connor, Raymond Paul, Louis Paturzo, Arthur Perrault, William Przybylo, George Raffaeta, Edward Reardon, Adolph Renkiewicz, Joseph Rozint, Robert E. Shea, Kenneth Shiner, Edward Tissera, Felix Werpechowski and Peter Zizka. Twelve others were identified from other religious orders or other dioceses related to allegations that happened in the Hartford Archdiocese. The six from other dioceses are Roman Kramek, Lucien Meunier, Edward Franklin, Bruno Primavera, John B. Ramsay and Jose Rivera. The six priests from other religious orders that were on assignment in Hartford are William Izquierdo, Michael Miller, Robert Leo Pelkington, John Pryor, John Rudy and John Szantyr. The former hospital chaplains were Altermatt, Ferguson, Glynn, Hyland, McGann, Mitchell, Paul, Raffeata and Rivera. Blair said the archdiocese has hired former state Judge Antonio Robaina to conduct a complete review of all the church’s files going back to 1953, when the diocese was formed. There was no timetable for when Robaina’s report would be completed. “It is a cause of profound sorrow and of soul-searching for me that we bishops, the Church’s pastors, have often failed to grasp the spiritual and moral devastation that results from sexual abuse, either in a misguided attempt to ‘save’ an abuser’s vocation or to shield the Church from scandal,” Blair said. O’Connor served as pastor of the Church of the Holy Spirit in Newington from 1969 until his retirement in 1997. That church was merged with St. Mary Church in 2017 to create Annunciation Parish. Church officials didn’t reveal the allegations against O’Connor, other than to say there were multiple claims of abuse. O’Connor was named in a lawsuit against Peter Zizka, another priest named Tuesday, who also was assigned at one point to the Church of the Holy Spirit. “It would be like finding out that your own father had done something like that,” he said. Of the 36 priests from the Hartford Archdiocese, 23 are now dead. None are currently priests. The most recently ordained priest to be accused was Gotta, who was ordained in 2006. He was accused of second-degree and fourth-degree sexual assault in November 2013, but the charges were reduced after the prosecutor cited unfavorable pretrial rulings. He later pleaded guilty in federal court to a felony charge of willfully distributing explosive material to a person younger than 21. Gotta admitted to purchasing two pounds of black powder from Riverview Gun Sales of East Windsor and providing it to a 17-year-old. The teen was subsequently found to be in possession of materials to make pipe bombs. Of the 48 priests named who have either had civil lawsuits filed against them or have been the subject of claims that archdiocese officials deemed credible are six priests from other dioceses who allegedly abused a minor while assigned to Hartford and six priests from other religious orders. Almost all of the claims were for abuses that occurred before 1990, and $35 million was paid out to victims who were abused in the 1970s but didn’t file lawsuits until years later. The average settlement was just more than $356,000. While nearly all of the abuse allegations occurred before 1990, nearly all of the settlements weren’t resolved until after 2000. The highest settlement paid was $1.6 million. Slightly more than half of the $50.6 million was paid by the church’s insurance carrier and the rest came from the general reserve fund. Of the 142 claims that were settled, about 84 percent involved allegations against nine priests. One priest had 20 credible abuse claims against him that were settled for $10.7 million. Blair said that there are no current priests in the archdiocese who have had credible accusations of sexual abuse made against them. However, the archdiocese is paying about $1,900 a month to two priests who have been sentenced to a life of prayer and penance and the same amount to two others who have been removed from the ministry. In the past three years, five priests have been laicized, or permanently stripped of their clerical authority. Those priests are Bzdyra, Foley, Hyland, Shiner and Tissera, also known as Edward Warnakulasuriya, who pleaded guilty to misdemeanor sexual assault for touching an 18-year-old man’s pubic area while administering confession. The archdiocese identified him Tuesday also as Wamakulasuriya. Hyland is listed in the Hall of Fame of the Connecticut State Firefighters Association website. The Rev. John Lavorgna of Mary, Mother of the Church parish in Waterbury said he will speak at upcoming Masses about Hyland’s inclusion on the archdiocese list. Hyland was pastor at Sts. Peter and Paul Church, one of two churches that constitute the current parish, until he was removed from the ministry in 2002 and laicized in 2016. “We will be addressing it in a prayerful and pastoral way,” Lavorgna said. John Sarlo of Waterbury, a member of Sts. Peter and Paul since 1964 and an usher since 1980, said Hyland was a friendly, jovial man. Sarlo said he never heard anything about allegations of abuse against Hyland. In 2001, when the city of Waterbury was reeling from a state takeover of municipal finances and a mayor jailed on charges of sexually assaulting children, Hyland spoke at an interfaith prayer service on the city green. Hyland was quoted in a Courant story as saying he sympathized with fellow residents’ feelings of embarrassment. A waiter in Lancaster, Pa., he said, had heard about the charges against former mayor Philip Giordano. ``Unfortunately, we’ve made news all over the country,'' Hyland said. Among the other priests, Bzdyra has been sued multiple times and Foley was the state police chaplain who used his position to lure kids into his car, according to his accusers. There were at least 11 claims made against Foley. A priest currently being sued in Superior Court in Waterbury and not on the list is Walter Vichas, who was a priest for 30 years at the Blessed Sacrament Church in Waterbury. The lawsuit filed by Kevin DiStasio alleges that Vichas sexually assaulted him in 1980 inside the church. The case is pending. "Nowhere is it mentioned that there are efforts to study the reasons why those with sexual desire for children or adolescents are attracted to the all-boys club of Catholic clerical culture. Why does the Roman Catholic Church attract men and women (nuns) with such a disturbed sense of sexuality?” McNamara said. He has filed several lawsuits against the Hartford diocese, including one against Ivan Ferguson in which a jury awarded the victim $1 million. David Clohessy. the former director of a national network of priest abuse survivors called SNAP, said Hartford’s decision to release the names is similar to what other dioceses are doing across the country. Victims can report abuse to the Hartford Archdiocese’s victim assistance coordinator, Kathleen D. Nowosadko at 860-541-6475 or Kathleen.nowosadko@aohct.org. In Connecticut, Survivors Network of those Abused By Priests (SNAP) offers support groups. For more information about the support groups, contact either Gail Howard at 203-644-0387 or pennyq99@aol.com; Beth McCabe at 860-335-8187 or thirdmccabe@comcast.net; or Jim Hackett at 203-710-0968 or SNAPCT@cotse.net.